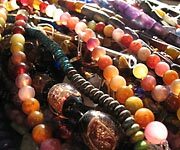 Each year in February approximately 5,000 unique vendors converge on the charming, eclectic southwestern city of Tucson, Arizona for the world's largest gem, mineral, meteorite, fossil, gem, and jewelry showcase. Vendors from all over the planet offer the finest selection of natural history wonders ever assembled. It all started pretty small, back in 1955, with a free exhibition put together at a local school. In later years the event that started it all moved to a spot in Tucson’s Rodeo Grounds. Over the years, additional shows sprung up and collectively grew into the largest and most amazing display of rocks, fossils, gems, minerals, jewelry, beads, dinosaurs, and meteorites of all time. Conservative estimates put the annual number of show visitors at 50,000, and that’s a big influx for a city with an urban population of about 550,000. Today, the Tucson shows consist of about 45 separate events running concurrently in hotels, parking lots, and tents from the end of January through the middle of February. Admission free except for one show at the Tucson Convention Center, and most are open to the public, though a few are wholesale only and ID may be required for entrance. This website is designed, written, and maintained by show professionals who live year-round in Tucson, and we know the show as well as anyone. Our insider tips will provide you with valuable information about buying, getting around town, where to stay, where to eat, what to see, the coolest vendors, and under-the-radar special events that only savvy show attendees know about. While at the show pick up a free copy of the Tucson EZ-Guide. There are a number of guides produced each year, but the TEZ, as we call it, is easily our favorite: handy and pocket sized, with a complete list of every vendor, dates and locations of every show, as well as travel tips, floor plans and much more. The TEZ is free and available at all of the 45+ show locations.